Wait until you try these individual cheesecakes! I didn’t know what to call them because they look like my giant cookies, but are really little cheesecakes. Whatever you want to call them, they are ridiculously incredible! Yes, break out your muffin top pan people, cheesecake works perfect in it. 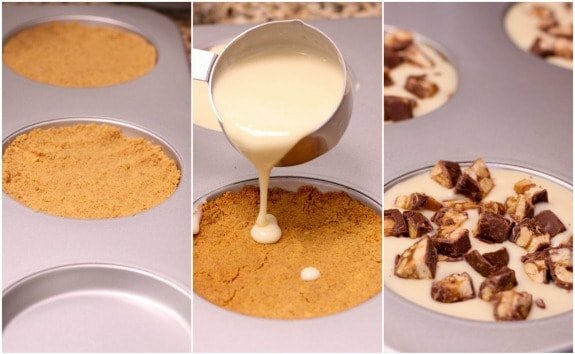 If you haven’t found your muffin top pan yet, you can try this in a mini cheesecake pan or even some mini muffin tins but make sure you spray your mini muffin tins well. It might be tricky to remove your cakes. Take a peek…hope you enjoy! Here’s your line up, pretty easy right?! Seriously if you don’t have the muffin top pan yet, it’s a must, here’s the EXACT one I use HERE!! 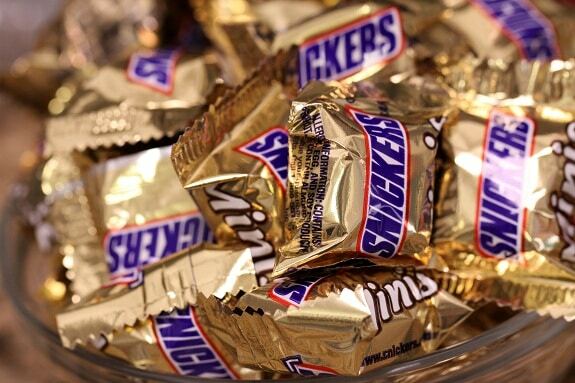 Snickers are my favorite candy…and these just look sinful! Love it! oh my word, these look dangerous!! sooo yummy!! I need to get a muffin top pan ASAP! 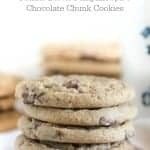 These look so decadent and yummy I wish I had a plate of them in front of me right now! snickers caramel cheesecake?? how fun!!! we’re also enjoying summer over here in Geneva/Switzerland! Ooooo, I wanna come visit! Have a beautiful summer! I love all the recipes you are using your muffin top pans with. I am going to order me some online as I can’t find them in this area. 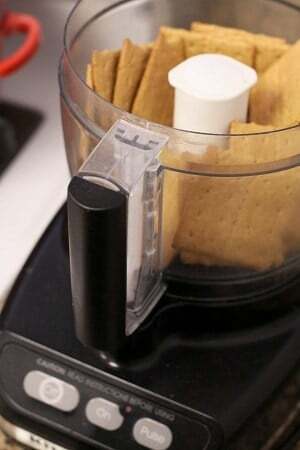 I have been wondering ~ do you spray the pan with cooking spray or do all the cookies, cheesecakes etc. release easily without any prep? I love your blog and read it every day. I don’t spray the pans and the cookies come out beautifully!! Hope you enjoy!! These look fantastically amazing! I’m off to buy a muffin top pan! you are evil woman…pure evil. boy i bet these would be good with a scoop of ice cream. I think I’m in love. Cheesecake AND Snickers? Seriously? WOW. I have a mini cheesecake pan, but I think these would look better in the muffin top pan. I guess I’ll have to go shopping! I found your blog not too long ago, but I read (and drool over) every post now. What an awesome idea…very creative!! Love them! Sinful, just sinful (in such a good way!). I totally want to get that pan! You make the most gorgeous things in there! Wow! I need this pan today…theres goes my lunch break! 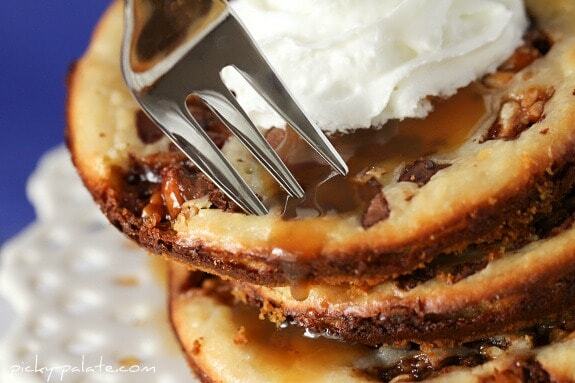 oh my gosh, need to make these!! you’re so creative jenny! I got 2 muffin top pans from amazon, with shipping it was $28. I have seen them at TJ Maxx and Marhsalls for much less. I thought about getting them at the time, but didn’t. I have wanted to get them for a long time. I now kick myself for not buying them when they were cheaper. OH WELL! I made the Giant S’more cookies, they were a hit at the coffee shop where I took them. Photos on my blog, but not pretty photos. These look fabulous!! can’t wait to try them! Looks like I need a muffin top pan ASAP!! 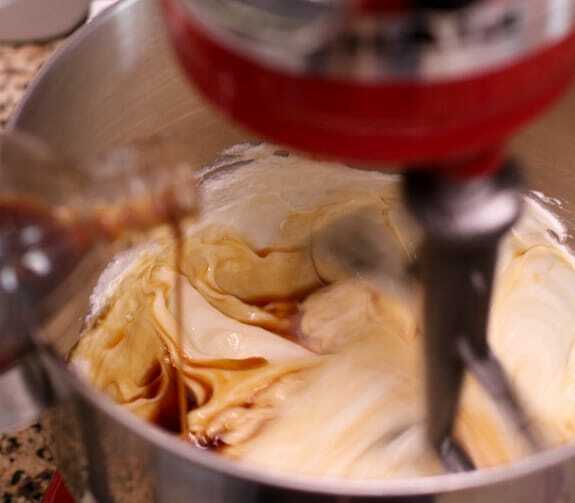 i didn’t even have a chance with these…i’ll be buying the ingredients later today and making them tonight! holy yum! woah!!!! these looks Devilshy Good!!!!!!!!! Is there sugar in the crust? 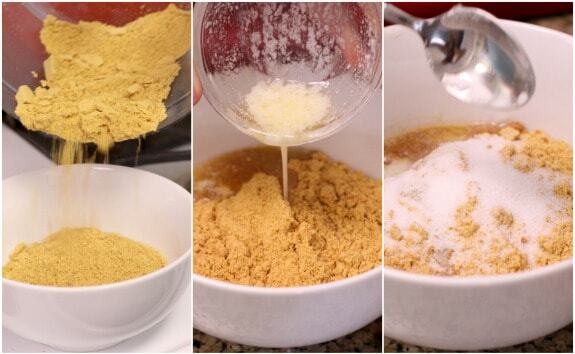 In the pictures it looks like you add sugar to the crust mixture bowl (last picture on the right), but its not in the actual recipe? I’m trying this recipe tonight! 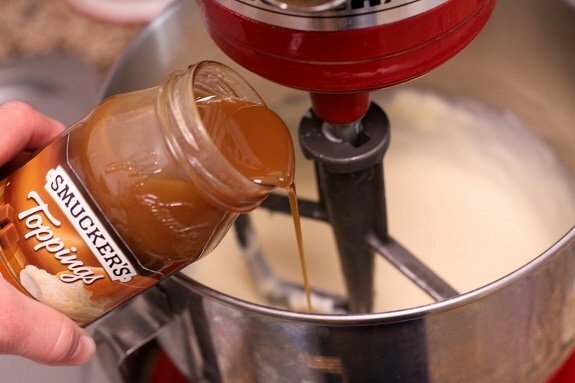 thanks for catching that, I just edited the recipe and added the sugar!! Oh lordy. Not only does seeing this mean a hit to my waistline, but I’m also going to feel the pinch in my wallet, since now I have NO CHOICE but to buy one of these pans! Ok I’m sold, I’m gonna look for a muffin top pan now! What a cute fantastic treat! Okay, I think you’ve convinced me–I totally need a muffin top pan. 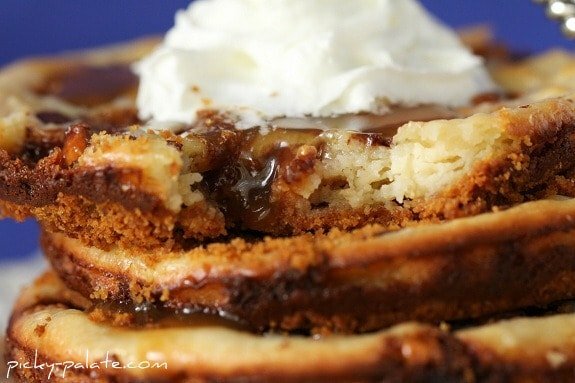 I’d make this with the almond snickers…and maybe almond extract instead of vanilla…almond caramel snickers cheesecake cookies? Yummm! Your killing me those are amazing. I had to order the pan from Bed Bath and Beyond I couldn’t find one to save my life. Oh my gawd! These look awesome. I just have to say, you come up with the BEST recipes. 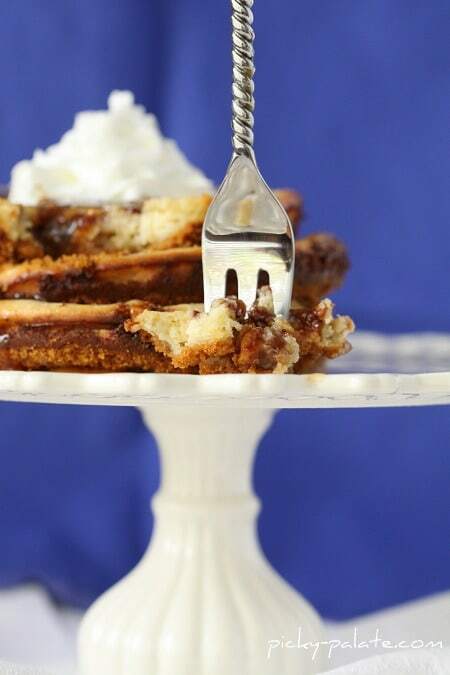 Sheeze, you’re killing me with that muffin top pan and all your creations! OH MY. tHESE WILL MAKE A WONDERFUL TREAT FOR THE GALS IN DR. MANDEL’S OFFICE. THANKAS FOR SHARING. Oh, you evil, evil person! I’ve been looking all over for a muffin top pan- now I must find one! ohmygoodness. must make these stat!! Oh my word! You are killing me! I am still feeling guilty about how much I had of the blueberry pie I made for the Fourth! But this is an awesome combination and I really have to try them. OMG they look so mouthwatering!!! Your pictures are amazing. 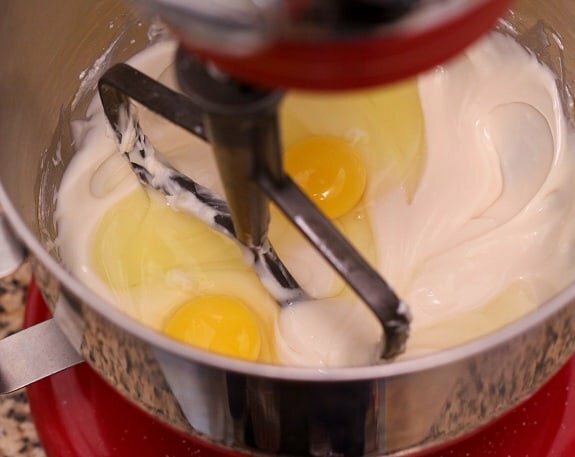 Going to have to try this recipe out for sure! These look scrumdidlyumptious for sure! And I just have to say that the fork with the twirled handle is really beautiful. Back to the cheesecakes, I wonder if these are like most cheesecakes and taste better after aging a day or so? I doubt we could leave them alone long enough to find out, unless I purposely hide one in the depths of the fridge. A cheesecake cookie? Whowuddathunkit? Very sweet as always. And muffin tops are in now. Muffin top pans that is. Looks wonderful. Hope you’re well!!! Wow, I don’t think these could look much more delicious if they tried. Yum!! First the giant s’mores cookies and now this! Whoa, girl…you are making me fat…and happy! I made your s’mores cookies for our 4th of July family reunion. They were a huge hit!! I’ll have to try these next. Thanks for another delicious creation! You are my hero! Seriously this recipe rocks. I love cheesecake. I say forget the fork. Eat and get messy with some awesomeness. Can you tell I love this? I think I’m going to have to stop reading your blog…I gain a few pounds each time I read a new post!! 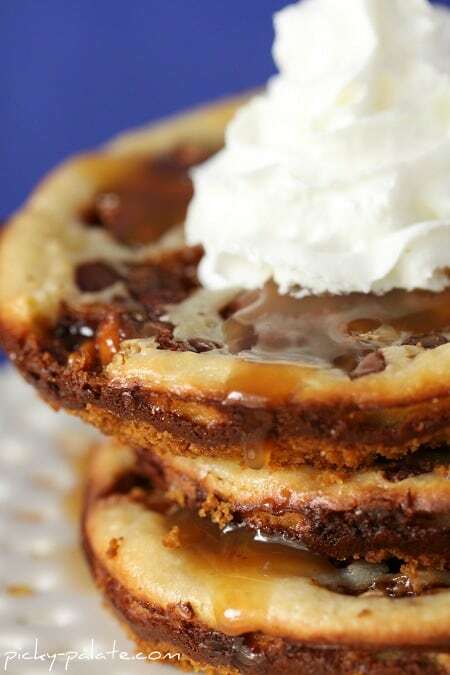 These look unnecessarily delicious…can’t wait to give them a try…AND I ♥ my muffin top pans too. The best thing I’ve bought so far this year! YUMMMY! They look like delicious cheesecae pancakes all stacked upon each other. Pancakes I would love to devour right now!! 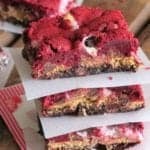 Oh my – these look decadent and something I am going to make this week-end. 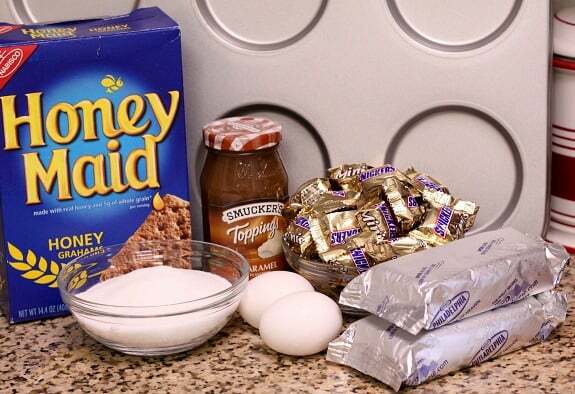 I may split the batch and make half snickers and the other half chopped peanut butter cups! Have a great week-end! YUM! What are you trying to do to me?! 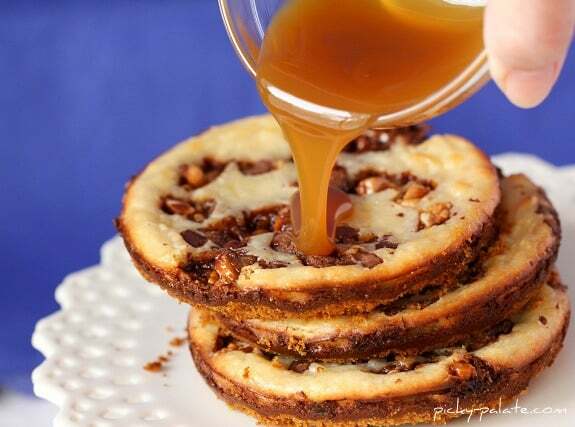 Another sinfully delicious use for my muffin top pan! Can’t wait to try it.